13-Inch MacBook Pro Specs Leak: Sandy Bridge, Light Peak..
New leaked photo suggest Macbook Pro 2011 will contain Sandy Bridge processor and Light Peak technology, but sadly no case redesign as others had assumed. As the first rumors stated, the new Macbook Pro machines will in fact feature Intel’s new Sandy Bridge processor. 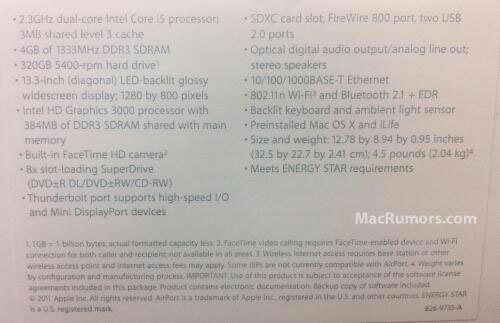 The box photo that you see below is courtesy of MacRumors and confirms the Sandy Bridge addition with the listing of the “Intel HD Graphics 3000 processor” on the spec panel. This is one of the new integrated graphics solutions that Intel is using in its Sandy Bridge series of chips. Apple is calling Thunderbolt. This appears to be the Light Peak implementation that everyone was talking about. Light Peak is Intel’s next generation connector technology that offers super-fast data transfer speeds, while also working with a multitude of different devices. Remember: These specs are just for the base-model 13-inch MacBook Pro, so the specs for the larger models could be different. As rumor has it these new models should be available on Thursday, February 24 — which incidentally, is Steve Jobs’s birthday.